A dual-action car polisher (often called "random orbit polisher" or "orbital polisher") is a machine that operates by orbiting the polishing pad around a center spindle while the pad freely spins on its own axis. A counterweight on the opposite side of the center spindle dampens vibration for smooth operation. The tool head action, often called orbital, prevents the creation of holograms (symmetrical buffing marks), paint burns and other forms of paint damage often associated with high-speed buffing machines. When used with proper care, the design of the Porter Cable 7424XP virtually eliminates the possibility of paint damage. The polishing action of the Porter Cable 7424xp & other dual-action polishers closely mimics that of circular hand polishing. Imagine being able to make 2,500 to 6,000 tight hand circles in a single minute and you'll have a pretty good idea of how the Porter Cable 7424XP Polisher does its job. Some people have defined the action of a dual-action orbital polisher as "jiggling", but this is not the case. The head freely rotates on a bearing and orbits around the centerline driveshaft. Rotation is a free-wheeling action of the backing plate spindle caused by the orbiting head. This "dual-action" is where the polisher gets its nickname. Most dual-action polishers use an offset spindle that freely orbits around the center shaft. A counterbalance weight dampens vibrations. The orbiting head action, combined with a high-speed motor offers the same gentle polishing action as your hand, only at super high speed. The Porter Cable 7424XP Dual Action Polisher has a powerful motor for its size (4.5 amps) If you don't have a garage, you can run the polishers off of your car battery using a 750+ watt power inverter. The Porter Cable 7424XP Polisher uses a standard 5/16-24 spindle, allowing it to take a wide variety of various attachments. The Porter Cable 7424XP Polisher measures about 10 inches in length and weigh about 6 pounds with a backing plate and pad attached. A reversible side handle makes the Porter Cable 7424XP Polisher very easy to hold and control, even when working on vertical surfaces. Use of the side handle is a personal preference. It adds a bit of safety, but people with large hands may find it just as easy to grip the polisher by the head with a single hand. The machine functions at 2,500 to 6,000 operations per minutes (OPM), controllable by a thumbwheel on the rear end of the machine. 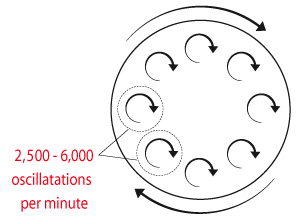 The OPM measurement is used instead of revolutions per minute (RPM) to distinguish the difference between orbits and center shaft revolutions. At 6,000 OPM, the UDM by Porter Cable car polisher does a lot of work. Comparatively, the Porter Cable 7424XP Polisher orbital polisher comes fully equipped with a Velcro backing plate and a functional foam polishing pad. Ultimate Detailing Machine also offers a fully equipped model with a full compliment of foam polishing pads and microfiber bonnet. 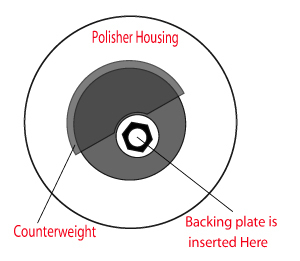 Changing polishing pads and backing plates is easy. You use the flat spindle wrench supplied with the car polisher to hold the spindle and rotate the backing plate counter-clockwise to loosen or clockwise to tighten. When tightening, it is not necessary to turn the backing plate more than turn once it has initially seated. Do not over-tighten. Snug is just fine. Changing backing plates is easy. Use the flat wrench provided with your Porter Cable 7424XP Polisher to hold the center spindle and unscrew the backing plate with your hand. Do not over-tighten. For safety reasons, do not operate your dual-action polisher unless the pad is flat on the work surface. That means you both start and stop the machine while it is resting flat on the surface of the car. If you're not going to follow this safety precaution, please wear safety glasses. Your car must be freshly washed and dry. Do not buff on a dirty finish. Work in an area with good lighting. Overhead fluorescent or halogen lighting is best. Remove all rings, watches, bracelets, belts and other items that will scratch your paint. Wear an apron to protect your clothing and the paint finish. Adjust the machine speed to 3 or 4 on the thumbwheel. This is a good starting point. With the machine switched off, apply a small amount of polish, cleaner or wax directly to the polishing pad. There are two good methods that seem to work. Squeeze out a complete ring of product about 1 inch in from the outside of the pad, or squeeze out an dime sized drop of product across the pad. Dab the pad in 3-4 spots around the area to be polished, cleaned or waxed to distribute the product. 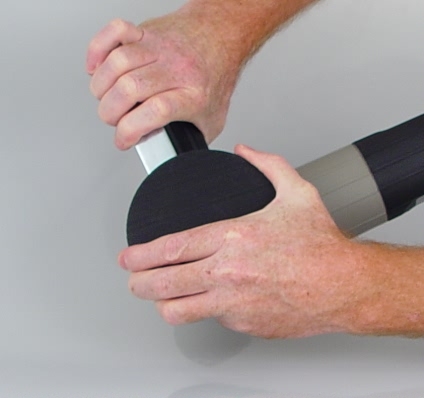 Position the polisher flat on the work surface, get a firm grip and switch it on with your thumb. Move the car polisher back and forth (east/west) in a slow, sweeping motion, overlapping each pass (by 50% of the pad width) with the previous, and then switch your pattern to up and down (north/south). It is not necessary to apply more than a pound of pad pressure. 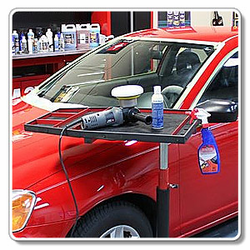 Allow the car polisher to work under its own weight. Use a clean pad with each product. Do not mix products on a pad. If a pad is not dirty, you may store it in a Ziploc baggie for future use. Be sure to label the baggie or the pad. If a pad becomes caked with product, use a nylon or horsehair detailing brush to clean the pad. Sounds pretty simple, doesn't it? It really isn't difficult. Within a few minutes of use, most people are very comfortable operating the machine. It is compounding and polishing, not waxing, that offers the most improvement in the overall appearance of paint. If you wax over bad paint, it's still bad paint. When you polish bad paint (paint with scratches, heavy oxidation, swirl marks, stains, water spots, etc. ), you remove the bad paint to reveal a fresh finish. Obviously you can only do so much polishing before you wear out (thin or completely remove) the paint, so only polish as much as necessary to maintain healthy paint. Buffing pad and polish makers create products with different levels of aggressiveness to make your polishing tasks faster and easier. You can use an aggressive pad and polish combination to quickly remove paint defects or severe oxidation, but it won't reveal the full gloss potential of your paint finish. Just like polishing a jewel, you must use several grades of car polish to bring out the final radiance. If your paint is new or like new, it is not necessary to use heavy abrasives. You can use very mild pre-wax cleaners and glazes to maintain the factory finish or create a finish that glows like a gem. To do so, use a fine polish and a foam polishing pad, and work the polish in with a light touch until most of the polish residue is gone. Remove the remaining polish residue with a quality buffing towel. Fine polishes won't take a lot of heat before they cake up and clog your pad, so don't apply pressure to the machine. Allow the pad and polish to do the work. Some polishes respond well to a microfiber buffing bonnet, while others do not. If you're using a polish that is not buffing out clear, try doing the final buff out with a microfiber bonnet over a clean pad. While the Porter Cable 7424XP Polisher is a very easy car polisher to master, practicing on an older car with an imperfect finish is the best way to learn. You should experiment with a variety of polish and pad combinations until you learn how to achieve the best results. There is no silver bullet combination of pads and polish. How you use the machine, your climate, paint hardness, paint color and other issues will all factor into the final results. Don't get frustrated if your initial experience is not perfect, as the smallest change (a different pad, polish or speed) can make a huge difference. A dual-action car polisher makes polishing easy and allows anyone to create a stunning finish or restore a badly worn finish. All it takes is a little practice and the right selection of pads and polishes.